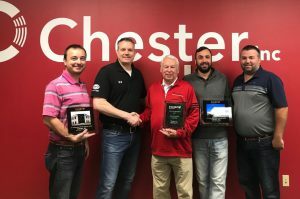 Chester Inc. of Valparaiso was honored by Chief Buildings for its work on building additions to Polycon Industries in Merrillville and Ratner Steel in Portage. The additions at both businesses helped the companies create a combined 150 new jobs, according to Chester Inc.
Chief, which is based in Nebraska and has a location in Rensselaer, annually recognizes outstanding building projects. The awards presented by Chief recognized Chester Inc.’s architectural and construction services division. Polycon Industries is a supplier of plastic and glass bottles and containers. Ratner Steel is a steel supply company.